Whales are the wonderful creatures on the planet Earth. They are the largest living animals among all land and oceans animals. Even the biggest dinosaurs that once lived on the Earth are smaller than the whales. Whales are mammals and there are two types of the whales according to the way they eat. They are toothed whales and baleen whales. The largest species of the whales are blue whales. They have a length between 80 to 90 feet and weigh up to 200 tons. Whales generally have cigar shaped bodies and a flat head. But, their necks are not flexible to turn around. They have flippers, a dorsal fin, and a large tail fin on their bodies to help them steer in the ocean. They have a blowhole on top of their heads for breathing oxygen from the air. Because they can’t breathe underwater like fishes. Different species of whales have different color shades, which are black, gray, brown, grayish blue and white. Whales are divided into two types according to their way of eating; Baleen whales and toothed whales. Baleen whales don’t have teeth to crush the food. Instead, they have comb-like filters called baleens. They mostly feed on krill and planktons. Toothed whales have teeth so they like to eat a wide variety of fishes including cod, salmon, tuna, and seals. 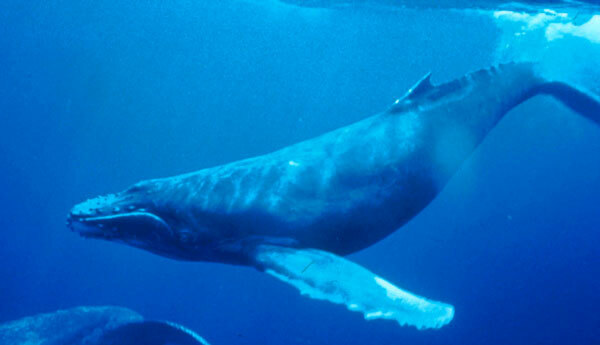 It is estimated that a blue whale can eat as much as 8,000 pounds of krill each day. Whales are the migrating animals, covering few thousand miles each year. They are found in all the major oceans around the world. The major factors of their migration are climate conditions and food supply. Whales are placed in endangered species list by U.S Endangered Species Act II. The number whales had decreased dramatically in oceans due to overhunting. But thanks to International Whaling Commission, which placed a catch limit for each country. The number of whales is seemed to increase in the oceans. There are 75 species of whales living in all the major oceans of the world. Blue whales produce sound between 10 to 30 Hz frequency for signaling each other. Humans can listen the sound from 20 Hz and above. Blue whales are so big that, their hearts are about the size of an average car. Whales have the life span around 90 years. But, the longest living whale was found to live more than 200 years. Whales need to come at the surface of the ocean for breathing. If they remain underwater too long, they may drown. The spout from the blowhole of the whale can reach a height of 30 feet. It is visible from miles away. Abdul Wahab, "Whale," in Science4Fun, April 13, 2019, http://science4fun.info/whale/.